Identification of individuals can be difficult in cases like accidents, or in mass disaster conditions. The oral cavity plays a significant role in identification of victims because it comprises of unique anatomy of dentition. However in certain cases, if teeth are lost due reasons like caries, periodontal problems. Human palatal rugae have been suggested as an alternative method for identification of the deceased for such conditions. Palatal rugae have been considered important for human identification due to its stability and accuracy, which is equivalent to that of fingerprint. Thus palatoscopy or palatal rugoscopy is used as evidence in forensic identification. The term "forensic" is derived from Latin, meaning forum or a place where legal matters are discussed. The science of dentistry as related to the law is known as Forensic dentistry or Forensic odontology. Identification of unknown human bodies is essential in modern societies for legal and humanitarian reasons. Forensic science also is not local, but global—we are all working in concert to address criminal justice issues, terrorism, health issues, and public safety. Forensic dentistry mainly involves the identification of an assailant by comparing a record of their dentition with a record of a bite mark left on a victim. Other uses in law for dentists include the identification of human remains, as the teeth are the most indestructible part of the body and the least turnover of natural structure. Establishment of person’s identity can be a difficult task in cases of traffic accidents or acts of terrorism or in mass disaster situations. Visual identification, use of dental records and fingerprints and DNA comparisons probably are the most common techniques used in this context, allowing fast and secure reliable identification. However, visual identification and use of fingerprints are limited by postmortem changes associated with time, temperature and humidity. Although teeth are more durable than other parts of the body, identification via dental records also may prove to be inconclusive, because dental treatment might have been performed between the creation of a dental record and the person’s death. Although DNA profiling is accurate, it is expensive and time consuming for use in large populations. Palatoscopy and Cheiloscopy are comparable to dental, fingerprint and DNA identification techniques. Since dental, fingerprint and DNA identification cannot always be used; sometimes it is necessary to apply different and less known techniques. So both palatal rugae and lip grooves can be used successfully in human identification. This paper is going to explain the role of palatal rugae in the forensic odontology as in certain situations, if teeth are lost due to any reason, then the use of human palatal rugae has been suggested as an alternative method for identification. Palatal rugae are one of the simple methods used by a forensic dentist in human identification due to its transverse ridges, stable in nature, and uniqueness. Rugal length and transverse palatal rugal region width increases with age. Also, it is a significant association between rugae forms and ethnicity as reported that palatal rugae patterns are unique to a particular community. The pattern of orientation of rugae is formed by the 12th to 14th week of prenatal life and remains stable until the oral mucosa degenerates after death. The palatine rugae possess unique characteristics that could be used in circumstances in which it is difficult to identify a dead person according to fingerprints or dental records. Palatine rugae are permanent and unique to each person, and clinicians and scientists can use them to establish identity through discrimination (Figure 1). Figure 1: Showing different pattern of palatal rugae. Palatal Rugae are anatomical wrinkles or folds called ‘plica palatine’, the irregular connective tissue located on the anterior third of the palate behind the incisive papilla. These are studied for various purposes mainly in fields of anthropology, genetics, orthodontics, prosthodontics, and forensic science. These are stable landmark, which once formed, do not undergo any changes except in length (due to normal growth) and remain in position throughout person’s life. Thus palatoscopy or palatal rugoscopy is used as an aid in clinical dentistry. The first system of classification was developed by Goria in 1911 and was rudimentary. The rugae pattern was categorized in two ways: specifying the number of rugae and specifying the extent of the rugal zone relative to the teeth. In this system, compound rugae of two or more branches were counted as one, whether they were V or Y-shaped. Goria further distinguished two types: simple or primitive and more developed. Lysell’s classification in 1955 is the most important, and it has been used widely in research involving rugae. Rugae are measured in a straight line between the origin and termination and are grouped into three categories (Table 1). Table 1: Showing different pattern of palatal rugae. This is rather simplified picture of the intricate form that rugae usually present. Therefore, Thomas and Kotze have further detailed the various patterns of primary rugae. These include branched, unified, cross-linked, annular, and papillary, among others. Carrea (1955) categorized four main types of rugae according to direction. They received roman numerals, while the sequence was indicated according to Arabic numerals and the shape denoted by letters. Basauri classification consisted of two groups: simple and compound. These, in turn, are subdivided into 10 types that describe particular shapes: 0, pointed; 1, straight; 2, curved; 3, angled; 4, sinuous; 5, circular; 6, Greek; 7, calyx shaped; 8, racketshaped; 9, branched. The classification by Lima consists of four main types: punctuate, straight, curved and composite (Figure 2) . 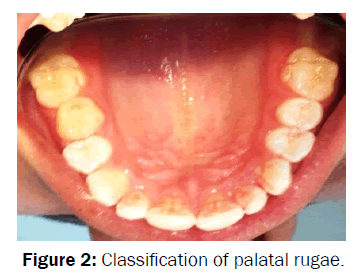 Figure 2: Classification of palatal rugae. It is a well-established fact that the rugae pattern is as unique to a human as are his or her fingerprints and it retains its shape throughout life. The anatomical position of the rugae inside the mouth—surrounded by cheeks, lips, tongue, buccal pad of fat, teeth and bone—keeps them well-protected from trauma and high temperatures. Thus, they can be used reliably as a reference landmark during forensic identification. Thomas and Van Wyk successfully identified a severely burnt body by comparing the rugae to the pattern on the victim’s old denture. Muthusubramanian et al. conducted a study to examine the extent of palatine rugae preservation for use as an identification tool in burn victims and cadavers. Patients with pan facial third-degree burns were examined within 72 hours after their accident. In addition, human cadavers stored in a mortuary at 5°C with 30 to 40 percent relative humidity and kept for a minimum of seven days were assessed for the condition of the palatine rugae. The authors took photographs of the palatine rugae by using a palatal mirror. The study results showed that among the subjects with third-degree panfacial burns, 93 percent of the palatine rugae were normal. The authors observed no changes in the color or surface anatomy of the palatine rugae in 77 percent of the human cadavers. They concluded that the palatine rugae could be used as a reference landmark during forensic identification of an individual. Palatine rugae can be used to assess the amount of anteroposterior tooth movement, because they remain stable during a person’s life. Moreover, the results of several studies show a significant association between rugae forms and different races. Palatine rugae are unique to individual can therefore be used for individual identification in forensic odontology. Palatal rugae pattern analysis has been employed successfully in positive human identification. However, reports of the validity of the technique are conflicting. The level of evidence for the application of palatal rugae in dental identification was found to be insufficient. A well-designed research protocol must be developed to determine if there is a statistical significance in utilizing digital photographs of palatal rugae for forensic dental identification purposes. The data concluded that rugae pattern are highly individualistic and can be used as an additional method for personal identification. Rugae serve as a reference landmark in various dental treatment modalities. Furthermore, the consequences of different studies showed an important association between rugae forms and different races. Palatine rugae are unique to individual and therefore can be used for individual identification in forensic dentistry. Singh K, Anandani C, Bhullar RK, Agrawal A, Chaudhary H, et al. Teeth and their Secrets – Forensic Dentistry. J Forensic Res. 2012; 3:141-3. Puerini SJ. Forensic odontology and the postmortem identification process. Medicine and Health Rhode Island. 2005; 88: 308-309. Lessig R, Wenzel V, Weber M. Bite mark analysis in forensic routine case work. EXCLI Journal. 2006; 5: 93-102. Caldas IM, Magalhaes T, Afonso A. Establishing identity using cheiloscopy and palatoscopy. Forensic Sci Int. 2007; 165: 1-9. Patil MS, Patil SB, Acharya AB. Palatine rugae and their significance in clinical dentistry: a review of the literature. J Am Dent Asso. 2008; 139:1471-78. Bhullar A, Kaur R, Kamat MS. Palatal Rugea – an Aid in Clinical Dentistry. J Forensic Res 2011; 2:1-4. Goria C. Le Rughe del Palato in SpecialeRapportocoll’ AnthropologiaCriminale e a Psichiatria” Archives of Criminal Anthropology 1911; 32:72-6. Lysell L. Plicaepalatinaetransversae and papilla incisiva in man: a morphologic and genetic study. ActaOdontol Scand. 1955; 13: 5-137. Carrea JU. Gaumenfalten-FotostenogrammeeinneuesidentfizierungsverfahrenFotostenograms of palate folds, a new identification technic. DtschZahnarztl Z. 1955; 10: 11-17. Basauri C. Forensic odontology and identification. 1961; 16: 45-49. Lima OC. Rugoscopia [Rugoscopy (Correia Lima’s process)]. Rev Bras Med 1968; 25: 806-807. Thomas CJ and Van Wyk CW. Elastic fibre and hyaluronic acid in the core of human palatal rugae. J BiolBuccale. 1987; 15: 171-174. Muthusubramanian M, Limson KS and Julian RJ. Analysis of rugae in burn victims and cadavers to simulate rugae identification in cases of incineration and decomposition. Forensic Odontostomatol. 2005; 23: 26-29. Segelnick SL and Goldstein L. Forensic application of palatal rugae in dental identification. Health Publications. 2005.